Nowadays it's so easy to sample the fun of RC cars with a small amount of outlay. The Prime Baja V2 is aimed squarely at that part of the market.. Its not a small 1/16 scale car but instead a full 1/10 2WD off-road R.T.R package that offers a lot of potential for the beginner and a lot more. The large box contains everything that you need to get started other than 4 AA batteries that you will need for the controller. The car comes with an 1800 nimh battery and a wall charger. It is a slow charger and it takes around 6-8 hours to charge the battery. It is good to see that they have deans connectors already fitted on the electrics as these work well, and are very reliable. As this car is ready to run there is nothing else to do other than wait for the battery to charge, so let's take a closer look. The car itself looks great, it has a classic frame style of look that reminds me of the classic buggies of old. The body is held onto the chassis with 4 bodypins. Once you remove them you can lift of the body to change the battery. The body is removed ready to fit the battery. 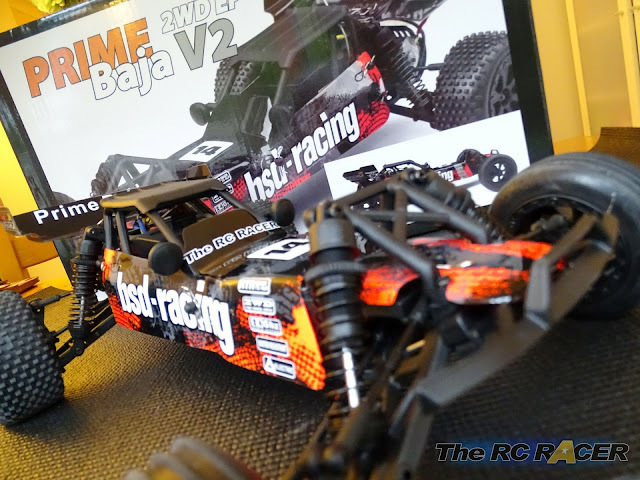 The BajaV2 chassis is a std tub style of affair. It feels stiff when you try to twist it and the plastics overall look to be well finished. 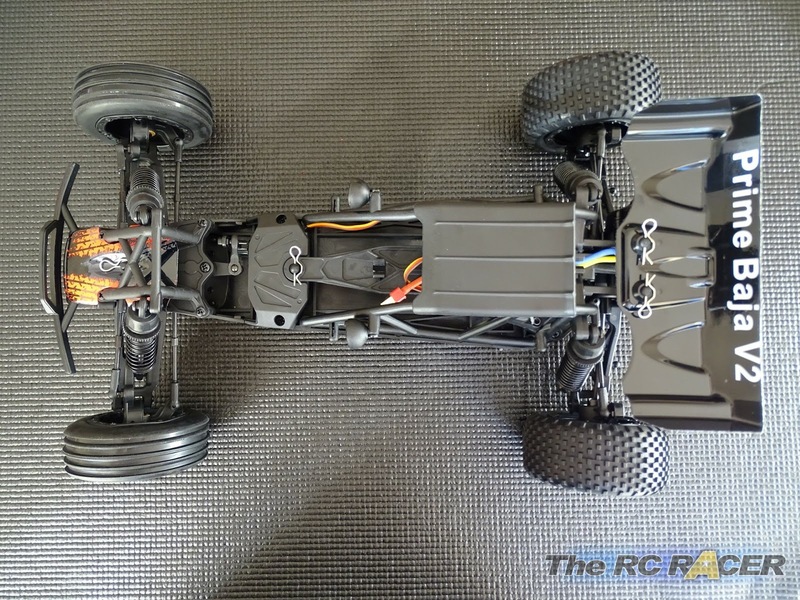 The frame section of the chassis has a roof section fitted which adds to the scale looks. This frame is more than aesthetic though as it holds an electrics tray. 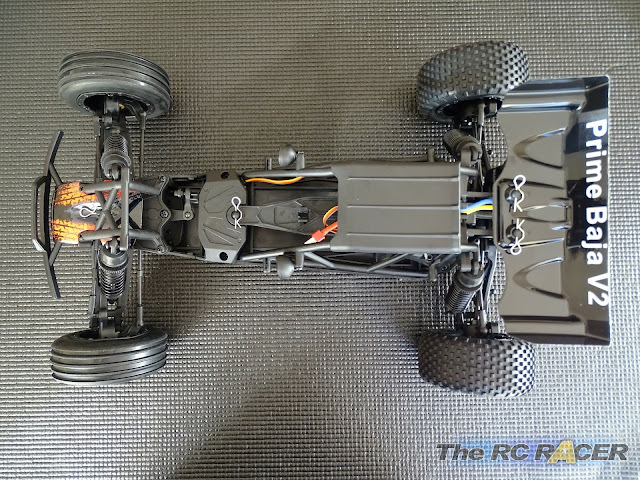 This is an interesting idea as it moves most of the electrics high of the chassis so it can be narrow, it also keeps the speed controller and receiver up and further away from the dirt and debris that this car will be subjected to. The Esc is brushed only and easy to program with jump switches. 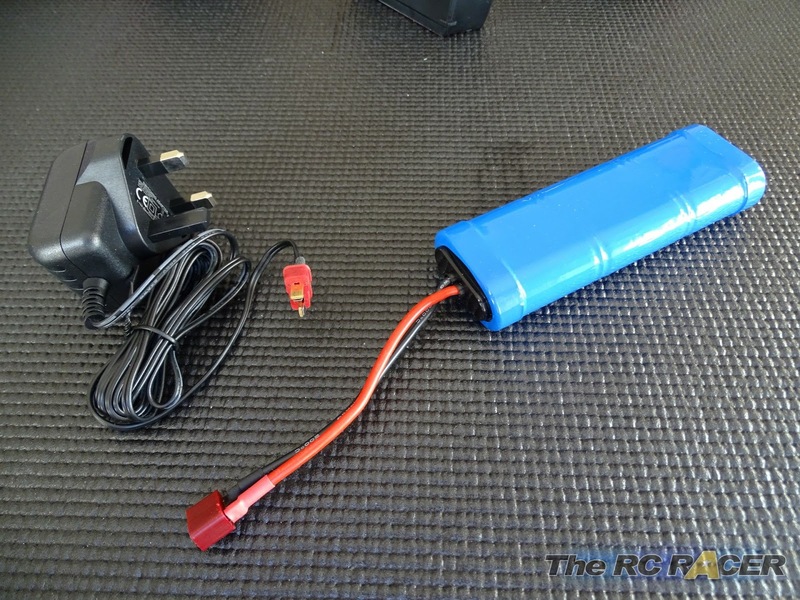 The battery is held in with a strap, and the battery compartment is very large so you can easily fit a square pack lipo in there. The motor is a 540 size and it is sports tuned so that should give more speed than a classic silver can. I took of the gear cover to take a look at the gearbox. There is no slipper clutch here. 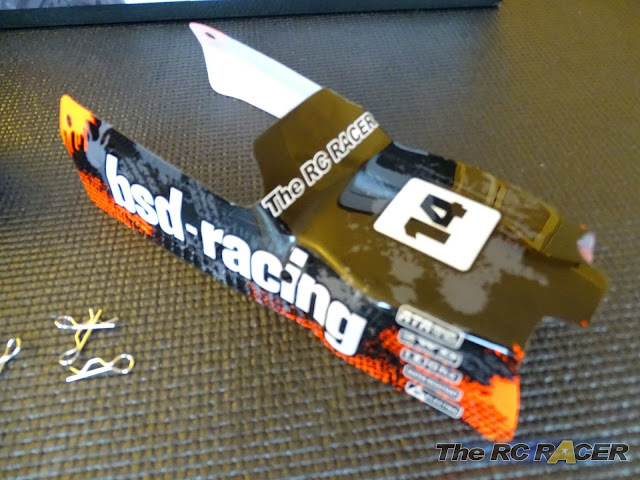 This is something that is great on a racing chassis, but will only cause issues for beginners. I was a little surprised to see a plastic pinion on the motor. I have used plastic pinions before when I used to race pro-10 but never seen one for a long time, so it will be interesting to see how this holds out. 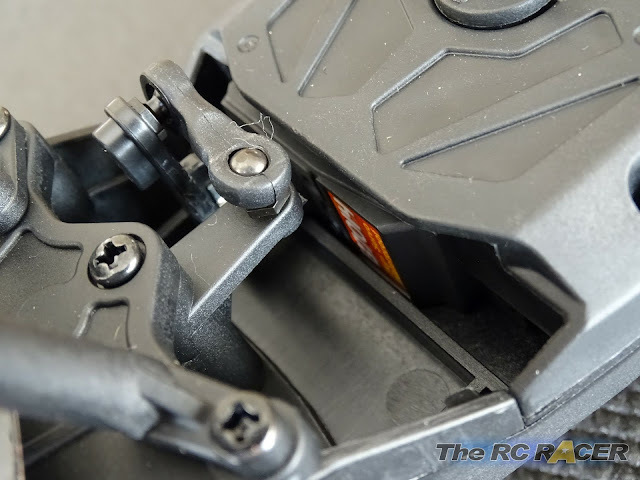 I did notice however that the gear mesh was very good for the pinion and spur (Something you should check on all kits, even when they come R.T.R). 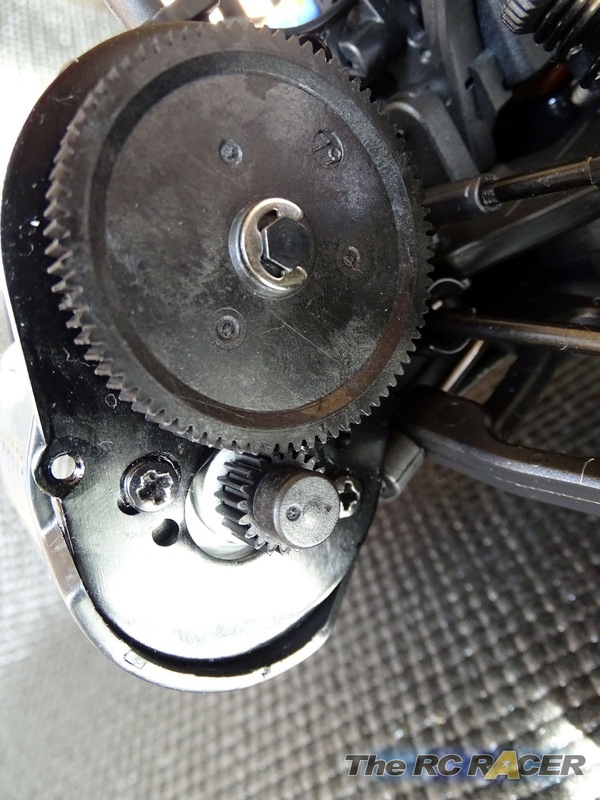 The rear differential is now a geared differential, this will make the car even more direct on power and will require even less maintenance, ideal for the beginner. The rear end is also very adjustable. The rear gearbox transfers the power to the back wheels via some thick steel dog-bones. 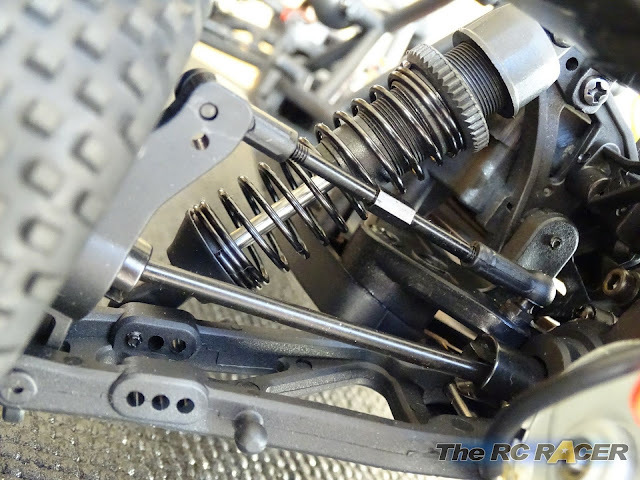 The rear shocks are plastic, but they are threaded and the springs seem to have a good level of resistance. I did open them up to check the oil levels and I topped up the rear as they seemed a little low for my preference. Moving up to the front of the car, again you have threaded shocks and a lot of mount positions to tune the suspension. The front (and rear) camber can be adjusted with the steel turnbuckles. You can also add or remove front toe-in via the steel turnbuckles on the steering rods. 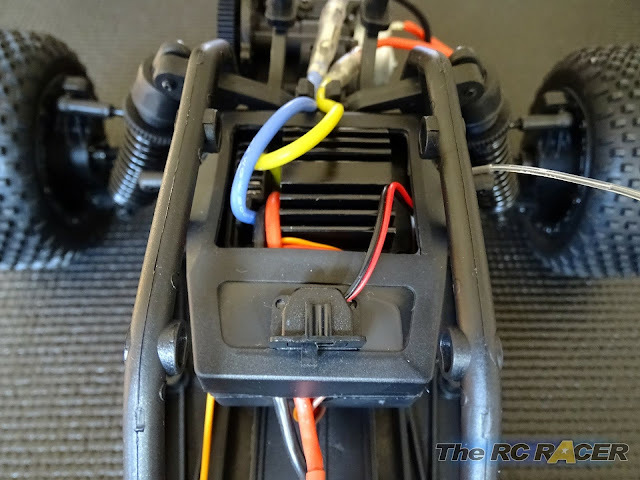 The steering is exact, it will be quicker if you change the servo saver for a plastic servo arm. 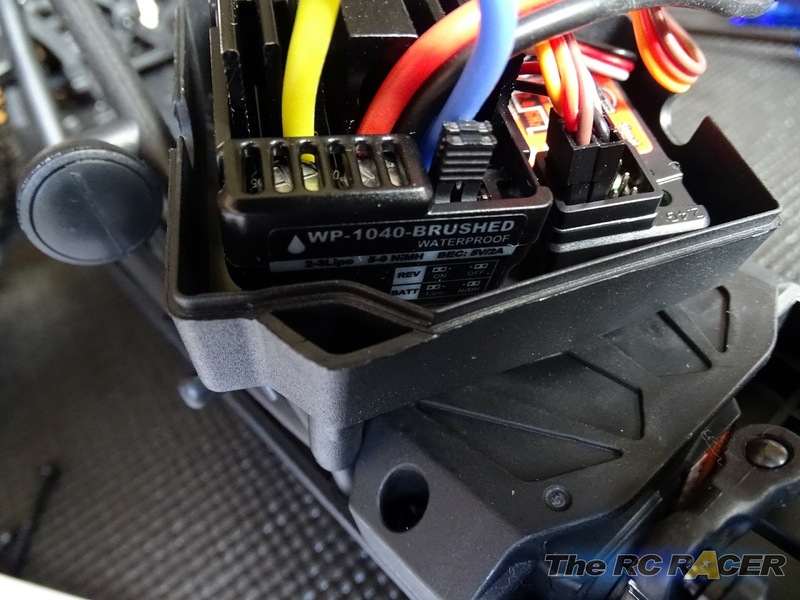 The steering itself is handled by a waterproof servo. This has a spring loaded servo arm that will help absorb most of the large knocks that the beginner can subject a buggy too. 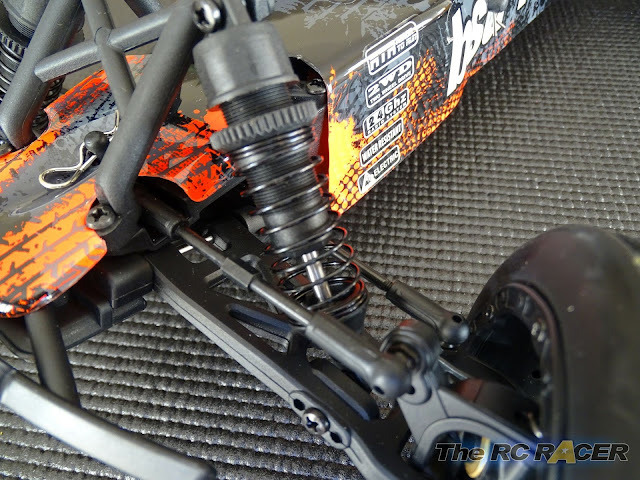 The overall quality of the plastics is very good, the shock towers and suspension arms are first pressing DuPont plastic parts. This means that they are off good quality and should be pretty tough.. although that is yet to be proven on the track test. 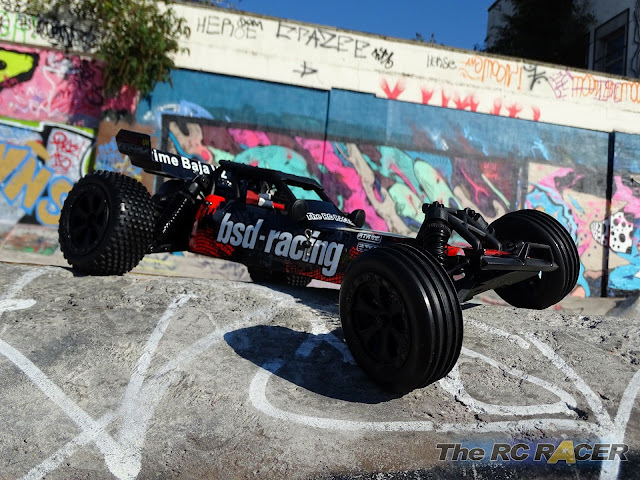 The Baja V2 is a good looking buggy and the attention to detail is even noticeable with the wheels. They are highwall bead locks, so they look pretty cool. The controller has the main functions that you would need. So with the car all checked over, let's see if this budget Baja will deliver on it's promise. This car is aimed as an entry level car so we thought the 'Stunt Track' would be a good place to test out if this car was up for taking some punishment. The car had the kit included 1800 battery installed for the first run. The trigger was squeezed and the Baja V2 screeched off the line. The Rear tyres were new and although soft they were a little slippy at first on the painted surfaces (Not uncommon). The car had a good turn off speed for a beginners car and I was able to kick the rear end out quite easily. I did notice that the steering was not that sharp, but I just increased the dual rate on the transmitter and this instantly had an effect. Obviously this car is 2WD so it will be much more suseptable to under-steering on power than a 4WD car so I had to quickly ease off the throttle if I wanted to make a sharper turn. 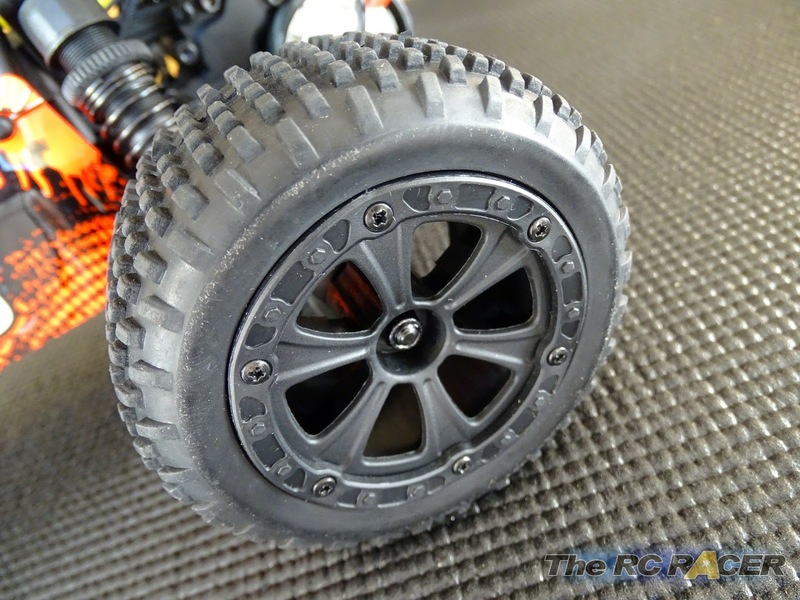 This throws the weight forward and ensures that the front tyres get more grip to help turn your buggy into the corner. After around 10 minutes the battery was getting low so I fitted a lipo battery for the second run. The extra voltage gave the car a little more kick as it sprinted away. By now the tyres had started to seat in and I was really getting to grips with the car. I started hitting the concrete kick-ups on the track and launching the car in the air. I was surprised at how well balanced it was. The narrow chassis with the weight all the way down the middle gave the car a nice natural poise as it glided through the air. The large oil filled shocks also helped absorb most of the landing force and the car only sometimes hit the deck. I tuned the car a little further by adding a little bit more front camber and a little less rear camber. I also tightened the rear springs with a few twists of the adjusters. Partly to reduce weight to the rear wheels on acceleration, and also for them to cushion the rear even more when the car would land from some of the large jumps. With the comfortable controller in my hand I was ready to get some footage for the video. I was really enjoying taking the car on the stunt track. The speed was good enough for me to have a lot of fun driving the Baja, and it allowed the car to get some big air and I didn't feel like it needed any more speed to be fun. The car was also resilient to me slamming into the wall a few times and rolling the car. The concrete surface is going to test the materials to the extreme, and after 40 minutes of running and some very over the top rolls and collisions with the brick walls the car was still in one piece. 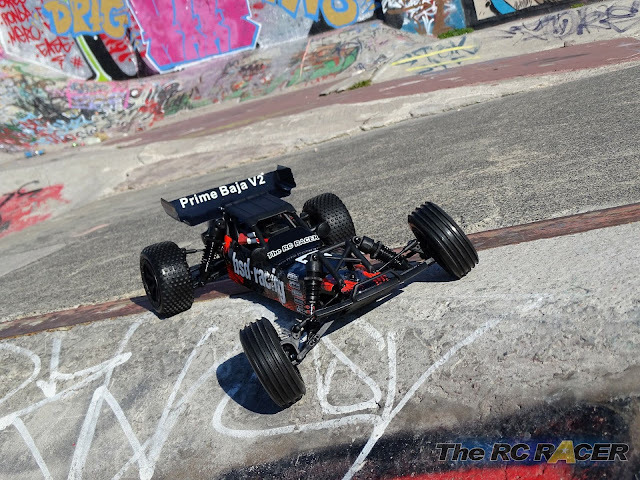 The BajaV2 is a entry level 2WD buggy that is aimed at those who want to sample the fun of RC cars without a big outlay. Here it succeeds. The car looks fantastic and it comes well equipped to take on the rigours of a beginners drive. Is the cage to keep people out or in? 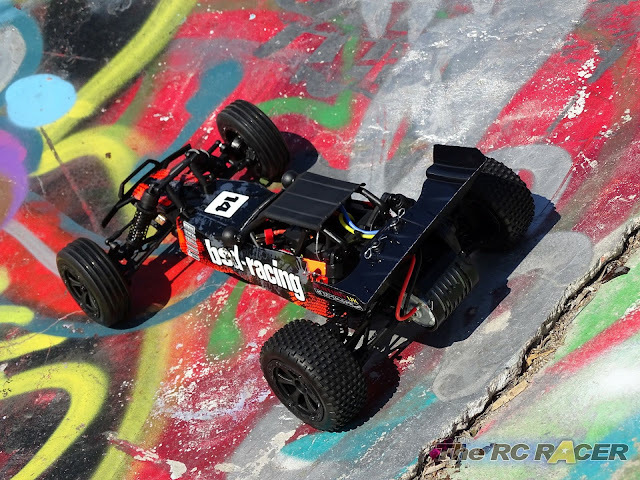 The speed and handling are fine out of the box, and you can quickly increase the speed by adding a lipo battery and charger to the collection. The car also has a good level of adjustability, so as you grow with the car you can start to tune the ride. In an ideal world it would be good to have a detailed instruction manual, (Although many people would not want to disassemble the car for fun. The plastic pinion is also something that was a little strange but with a good few hours of driving it is all still fine. 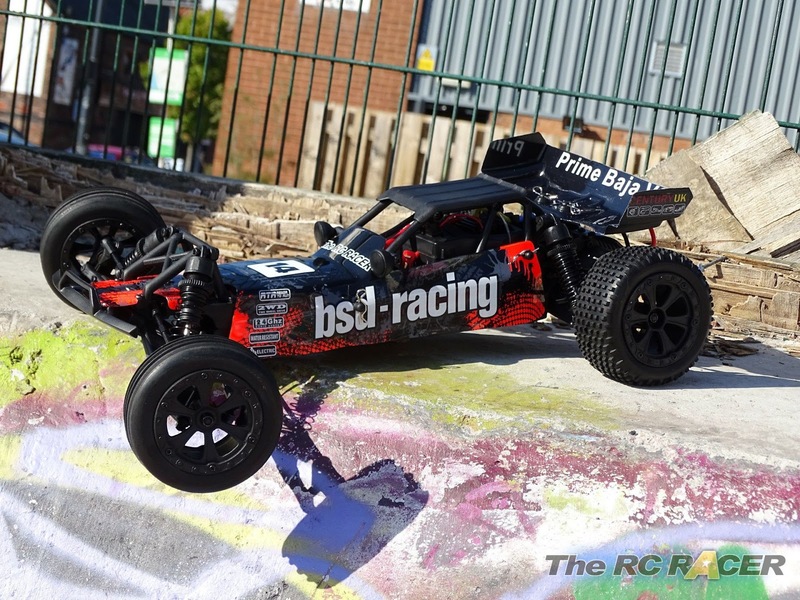 If you are looking for a fun entry level RTR 2WD buggy then the Century UK BSD Prime Baja V2 could be a good car for you. Available from your local Century-UK stockist. Contact www.centuryuk.com for more info. 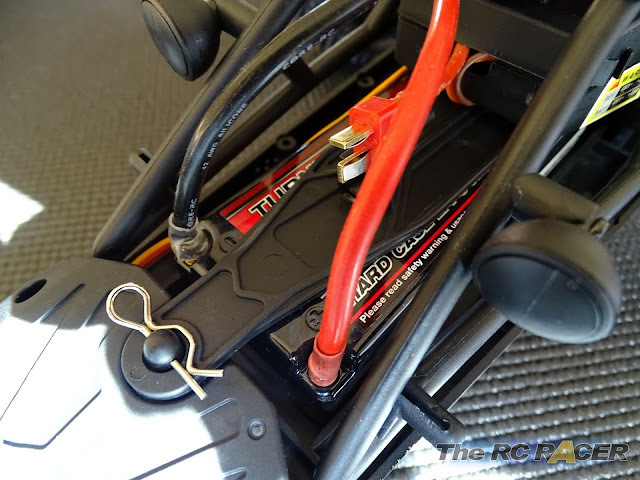 What battery did you use and also what do you need to do to the ESC if using a lipo? You just need to move the jumper to the other position to enable the lipo cut-off. The instructions are in the box on how to do it. 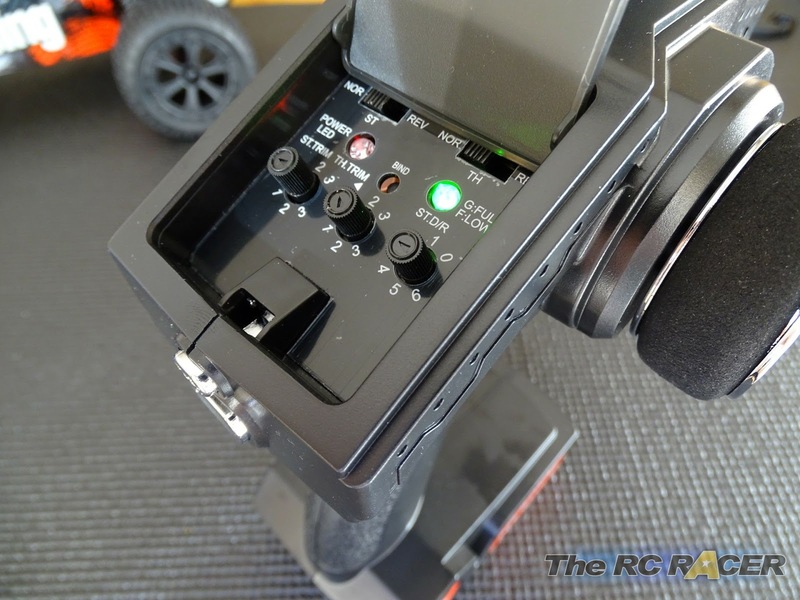 I used several batteries including the kit one. As a rule though I used some 5000 lipos in it as they gave it even more punch.